Medical advances happen when science is able to stretch beyond its known boundaries. To make those advances, several faculty at the University of Mississippi Medical Center are using a technology that is as flexible as its name implies. UMMC is one of the nation’s leaders in developing elastin-like polypeptides, or ELP, for applications ranging from drug delivery to tissue engineering, now holding five patents related to its use as a drug-delivery tool. ELP is a synthetic molecule based on elastin, one of the most abundant proteins in the human body. Elastin allows your blood vessels to dilate and contract, your lungs to fill with air and your skin snap back in place after a pinch. In fact, ELP was developed as a model to understand the protein’s stretchiness, said Dr. Lee Bidwell, associate professor of neurology. UMMC’s most recent patent was issued September 25 for a drug-delivery method to increase the safety of medication use in pregnancy, authored by Bidwell and Dr. Eric George, assistant professor of physiology and biophysics. “Many drugs have either a known risk or toxicity to a developing fetus, or there is not enough safety data to know that risk,” Bidwell said. Because many drugs can cross the placenta into the baby’s bloodstream, physicians may not be able to treat a pregnant woman’s medical conditions, whether they are related to her pregnancy or not. The patent covers a broad range of applications, but one of the essential innovations allows for attaching a drug or therapeutic agent to an ELP, which can prevent drugs from crossing the placenta. The ELP can also make new kinds of therapeutics viable. “When you attach an ELP to a drug, you alter that drug’s plasma half-life,” Bidwell said. In other words, you can increase or decrease the amount of time therapeutic levels stay in the blood stream, increasing efficacy. For example, the new patent also covers a way to use ELP to target therapeutic agents to the placenta and other maternal organs as a way to treat preeclampsia, a serious complication of pregnancy involving high blood pressure and abnormal blood vessel formation in the placenta. How can the same molecule both prevent and facilitate drug delivery to a particular part of the body? It’s all in the design. Scientists grow customized ELP sequences in bacteria by encoding a sequence in its genome. The bacteria produce the peptide, which can then be isolated and used. Depending on the sequence used, it can take on different sizes and shapes that affect its physical properties. If an ELP is sufficiently large, it can’t pass through a cell membrane. “We are able to cut and paste DNA sequences to create something that has never existed before,” said Dr. Drazen Raucher, professor of cell and molecular biology. Bidwell, an alumnus of UMMC’s biochemistry Ph.D. program, studied ELP with his mentor Raucher, who in turn studied the techniques as a postdoctoral fellow at Duke University. The work started as a short-term time-filler experiment during Raucher’s first year as UMMC faculty. Raucher’s primary research continues to focus on using the molecule for thermally-targeted drug delivery to tumors. Local hyperthermia, raising a tumor or body part’s temperature by a few degrees, can make the composite aggregate and allow the drug to work. He’s the author of three patents, alongside Bidwell, for cancer therapeutics and thermal targeting. In 2016, Raucher and Dr. Parminder Vig, professor of neurology, also authored a patent that uses ELP for targeting neurodegenerative conditions in the brain and spinal cord, including spinocerebellar ataxia. However, ELP has many more diverse applications than drug delivery. Dr. Amol Janorkar, professor of biomedical materials science, uses ELP in his research using techniques he learned as a postdoctoral fellow at Harvard. One of his lab’s projects uses a combination of ELP, polyelectrolytes and cells to create “stable spheroid” models of liver and adipose tissues. Janorkar is also studying the physical properties of different ELP configurations and how to use that information to create nano- and micro-particles for various applications. 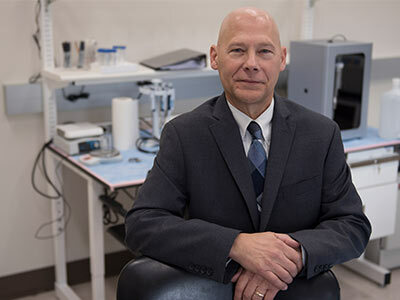 Dr. Jim Petell joined UMMC in October 2017 as director of the Technology Transfer Office. Dr. Jim Petell, director of innovation development and licensing, said UMMC’s overall ELP portfolio accounts for nearly 20 percent of ELP-related issued patents in the United States, making the Medical Center one of the top institutional leaders in this field. The IDL office is working with the inventors to determine the best ways to commercialize the whole of UMMC’s ELP-related IP. So far, Raucher and Bidwell each have spin-off companies, Thermally Targeted Therapeutics and Leflore Technologies, targeting different applications. “Having an established company set up makes it easier to work with other companies and get private investment,” Raucher said. Among the different projects happening at UMMC, the ELP application that may be closest to market – although still several years away – involves techniques for targeting the kidneys. Bidwell and Dr. Alejandro Chade, professor of physiology and biophysics, have a patent application which they expect to issue. “For the next steps we’re focused on dose escalation studies to determine the safe dosing range, and eventually finding an independent, good laboratory practices partner to continue testing and remove bias,” Bidwell said. Despite ELP’s flexibility, there remains a number of hurdles for each potential use. “Only about one in every six or seven configurations turns out to be useful,” Raucher said. Furthermore, certain applications, like the need for heating devices to make thermally-targeted versions work, may limit its use. Creating an ELP is relatively easy, Bidwell said. Rather, its limitations come from physiological restraints of the body, like breaking directly through the blood-brain barrier. ELP on its own is inert. The functionality comes from what you attach to it, like a power drill with interchangeable bits. These modifications include cell-penetrating peptides to break past the membrane, targeting sequences for certain receptors, and therapeutic peptides. Each of the UMMC patents covers one or more of these components. From a business development standpoint, Petell said, packaging all of UMMC’s ELP-associated technologies as part of a single toolbox means corporate collaborators have a one-stop shop to use these advancements and access to our combined expertise. “The interconnected approach gives business partners access to the broad range of our ELP intellectual property portfolio without requiring multiple licenses for their specific product,” Petell said. Bidwell said working with ELP is satisfying because of its flexibility.